Visible from afar, the 743-metre-high rocky massif of Hohenneuffen towers above the Alb escarpment. 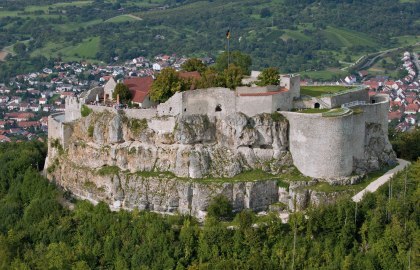 The ruin of Hohenneuffen Castle – the largest complex of its kind on the Swabian Alb, has its origins in the High Middle Ages. The mountain castle built before 1140 was the seat of the Lords of Neuffen before passing into the possession of the Counts of Württemberg in 1301. 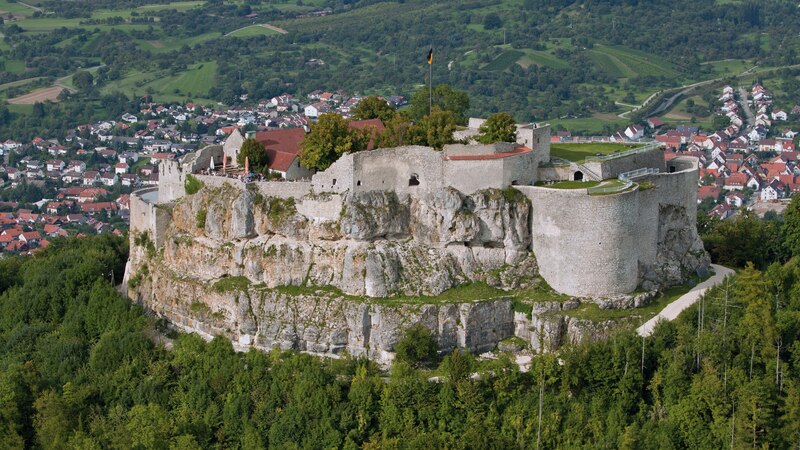 In the 16th century, Hohenneuffen was turned into a fortress, one of seven strongholds for the defence of the state. The fortifications were built in accordance with contemporary military technology. The three round bastions that held the artillery, and the upper ramparts, which are over three metres high, continue to define Hohenneuffen's appearance in the present day.